Pre-OrderDispatched within 2-3 weeksOrder now and we`ll dispatch as soon as stock arrives. 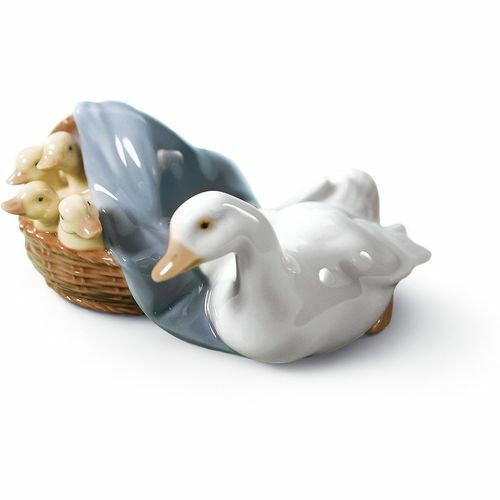 This Lladro piece is a porcelain figurine of four adorable ducklings snuggled up to a blue blanket in a wicker basket. A mother duck sits beside gazing a watchful eye over them. The comical expression on each of the ducks faces is highlighted by the pastel hues of blue, yellow and brown in the fine porcelain. An intricate wicker pattern decorates the basket, completing this wonderful piece from Lladro. Lladro Porcelain is produced by Artisans in Valencia in Spain. Lladro is made for memories, these beautiful classic and timeless creations make the perfect gift for all those special occasions throughout the years and make wonderful keepsakes for family & friends to treasure. Each piece is lovingly handmade and hand painted & comes with their unique Lladro markings by the Valencia Artisans. The Lladro Ducklings comes presented in its Lladro presentation box & a certificate of authentication.